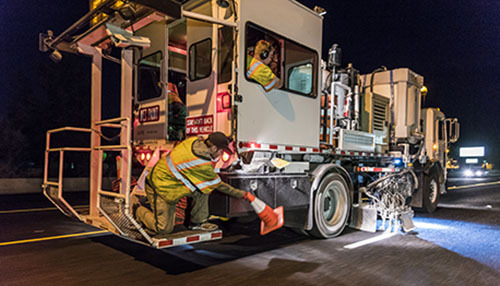 As soon as the temperatures allow, usually May until mid October, the ACHD Paint Crew is out refreshing pavement markings throughout Ada County. Seasonal workers are added to the team to assist in completing this arduous task in a safe and timely manner. To minimize inconvenience and maximize safety to commuters, high traffic areas are striped between 3 a.m. and 6:30 a.m. The temperature must be at least 50 degrees for the paint and glass beads to spray correctly and adhere to the roadway surface. Drying times vary depending on temperature and humidity. Preformed Thermoplastic What are the Advantages? 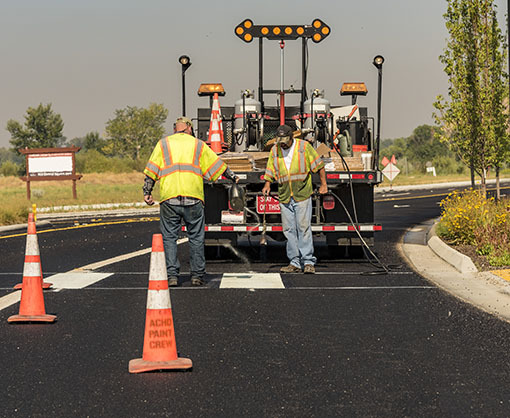 Preformed Thermoplastic roadway and intersection markings are more durable than paint and do not require annual maintenance. Markings and symbols are pre-cut and used universally so they are familiar to the commuting public. It is applied using heat and the reflective glass beads are added while the thermoplastic is hot. Thermoplastic adheres well to chipsealed roadways, wears well in high volume roadways, and lasts approximately six years. Unlike paint, it is not weather sensitive and can be applied in freezing temperatures.